Most of the parts available on my website require advanced skill to install on your build. 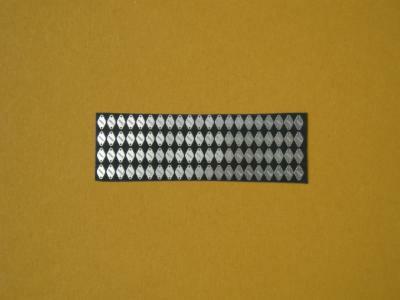 Fabrication or modification of them may be required due to the broad range of applications to which they are suited. Be sure to use appropriate protection when working with tools or chemicals which represent a potential threat to your personal well-being. PRODUCT DELIVERY - My goal is to ship within one week's time of receipt of payment, however, please allow up to three weeks for delivery. I will contact you if I foresee a significant lag in order fulfillment. Delivery times subject to change. If you encounter problems ordering parts, please feel free to contact me at scott@futurattraction.com. 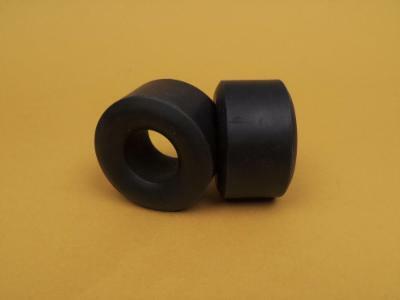 These 1/12th scale bezels are the perfect way to finish the fender exit holes on your high-powered doorslammer build. They are especially well-suited if headers exit at an angle. They are etched out of .004 stainless steel. These bezels are the perfect way to finish the fender exit holes on your doorslammer build if the headers exit perpendicular to the body. They are etched out of .004 stainless steel. 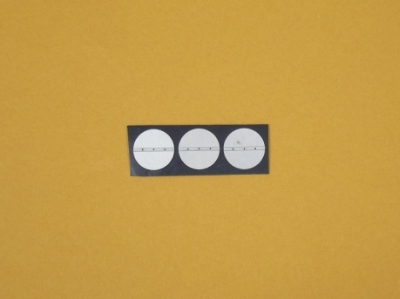 These self-ejecting Dzus buttons replicate the quarter-turn fasteners used on all manner of race cars, especially on panels that require simple, quick removal for between-rounds maintenance. Etched out of .004" stainless steel. 84 pieces per set. 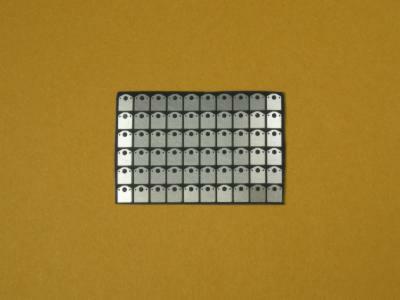 These mounting plates are photo-etched out of .006 nickel-silver plate. 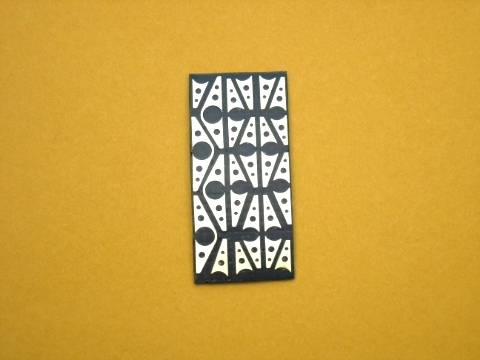 These plates are of a swiss cheese design. This style is used a lot on current race cars and add great realism to your build! 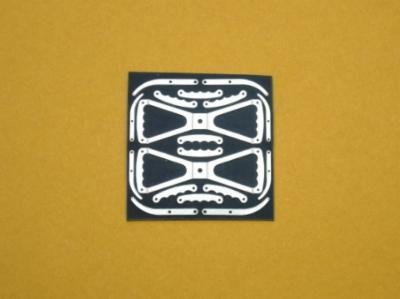 These mounting plates are photo-etched out of .006 nickel-silver plate and are of the basic design that has been around for ages. They will add great realism to your build! 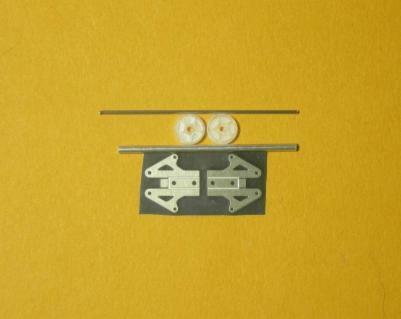 These 1/12th scale front end mounting brackets will work perfectly to mount a removable front clip on your build. 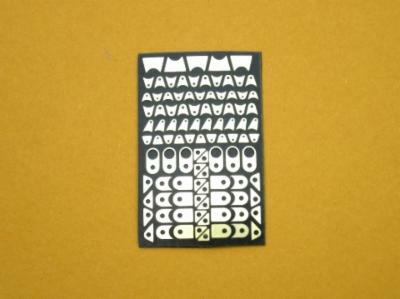 These 1/16th scale bezels are the ideal way to finish the fender exit holes on your high-powered doorslammer build. They are especially well-suited if headers exit at an angle. They are etched out of .004 stainless steel. These 1/16th scale header bezels are the perfect way to finish the fender exit holes on your high-powered doorslammer build. They are especially well-suited if headers exit at an angle. They are etched out of .004 stainless steel. 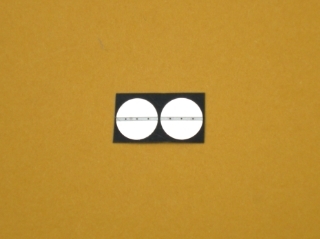 These 1/16th scale window bezels are intended to add a finished look to the emergency access hole that is required in many doorslammer cars so track personnel can reach through a window to open the door in case of an emergency. They are etched out of .004" stainless steel. Enough to finish two cars. 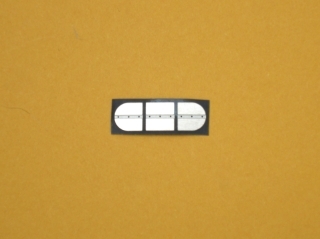 These pieces are intended to enhance the cockpit of your 1/16th scale dragster, altered or funny car project. Butterfly wheels include separate grips for additional detail. 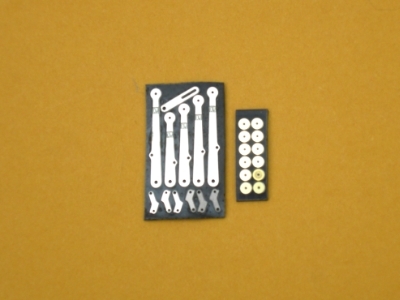 These levers are intended to offer additional detail to the interior of your 1/16th doorslammer build. 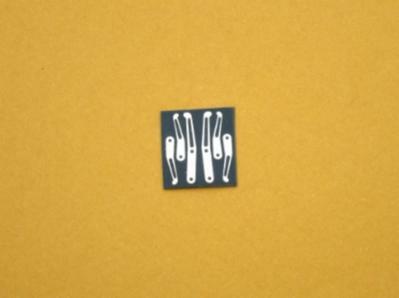 They can be used for interior door latch levers, parachute release, or what-have-you. Designed to have a modern, lightweight appearance. These dragster pedals can be used in any category of 1/16th race cars you choose. 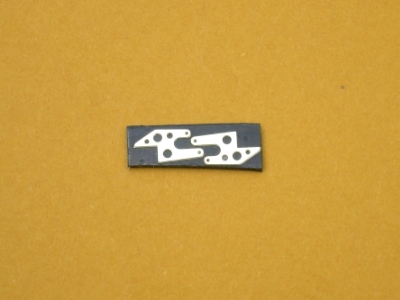 Both a side toe loop as well as one on top of the pedal are offered. The unused one can simply be trimmed off. Fabrication required to attach the pedal to a pivot, if so desired. 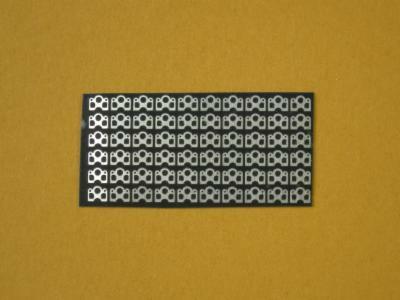 These mounting plates are photo-etched out of .006 nickel-silver plate. I refer to them as a "hex" design, simply due to the rough profile of the plate. They can be used to add to the realism of your build. 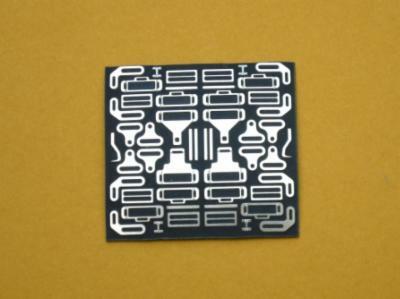 These mounting plates are photo-etched out of .006" nickel-silver plate. These plates are of a swiss cheese design. This style is used a lot on current race cars and add great realism to your build! These brackets are intended to simulate the mounting brackets used to locate removable front ends from drag or other styles of cars. 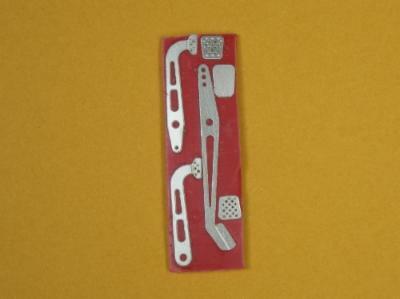 These 1/16th scale photo etch sets replicate a more contemporary style of hardware used by many race cars today. 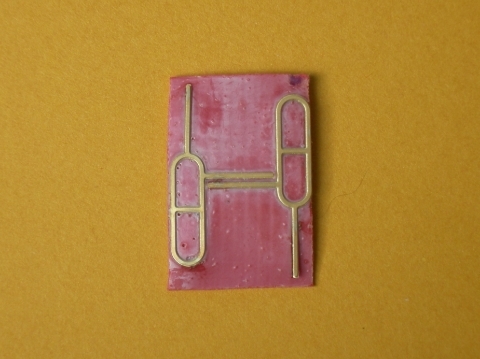 Etched out of .010" nickel-silver, these require patience and dexterity when assembling, but the results are worth it. The origins of this style of racing harness hardware dates back to WWII. It is still available today. These 1/16th scale sets replicate the basic style of hardware used by many race cars even today. Assembly, patience and dexterity required! These levers, with separate hand-grips, offer great detail for dragster or funny car builds. This set of 1/16th scale pedals is the perfect way to add additional detail, with a billet look, to the interior of any race car. Easy to assemble. Includes separate pedal pads for extra realism! These rotors are designed to compliment the MicroNitro scalloped rear hub. The OD of these rotors is .7344", which scales out at to 11.75 in 1:1. 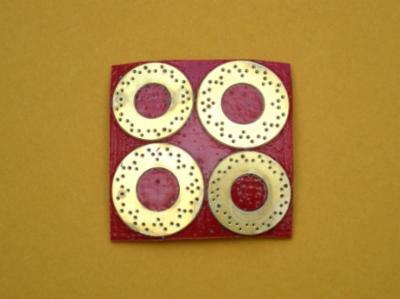 These drilled rotors are well-suited to fitting a door-car type of build. 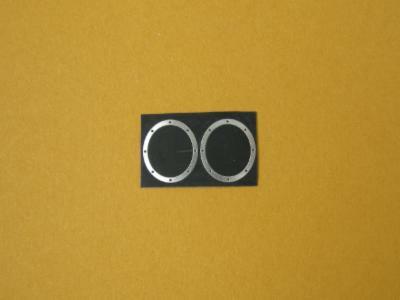 Dimensions for the fronts are .625" OD (10"), with a hub hole of .1875" (3" in 1:1). Material thickness is .016". OD of the rear rotors is .7032" (11.25") with a hub ID of .325". 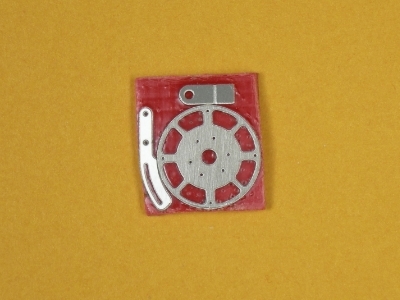 These slotted rotors offer another design option for 1/16th scale door-car build. 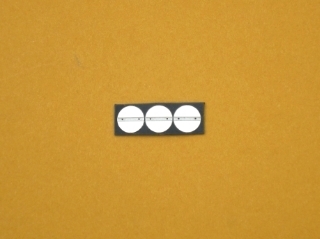 Material thickness of them is .016" (.250" in 1:1). Outside diameter is .625" (10" in 1:1), with a hub ID hole of .1875" (3" in 1:1) Rear rotor OD is .7032" (11.25") and hub ID is .325". These strut gussets are intended to provide support and a touch of detail to the top strut mount on door slammer type race car builds. There are enough sets for several builds. These brackets and tabs can be used in a variety of build environments, where you need a bit of detail or some type of attachment point for a handle, a gusset for a bracket, etc. This kit comes with two wheelie bar wheel housing brackets, two 3D-printed (FUD material) wheels and axle material. Telescoping axle material is cut longer than should be required. 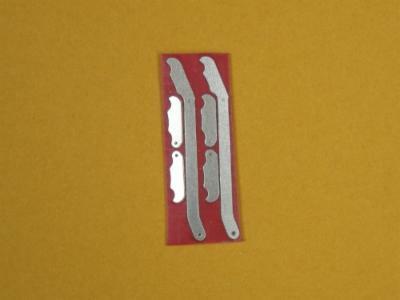 These window mounting tabs are designed to attach and support window glass material in 1/16th scale doorslammer doors. Etched from .006" brass. Out of Stock! 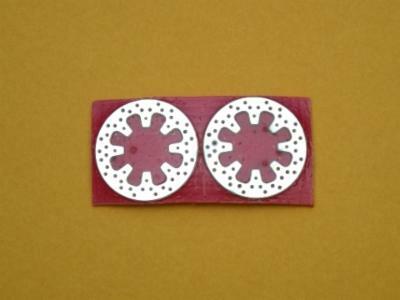 This set of injector throttle plates fit the 1/16th scale Competition Resin CRC034 ribbed injector hat, which fits the CRC041 blower. 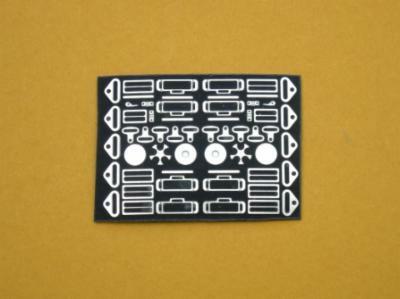 This set of injector throttle plates fit the 1/16th scale Competition Resins 035 hat. 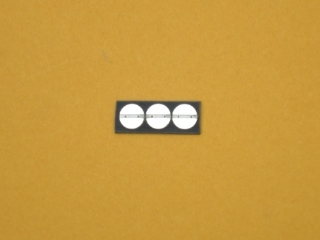 Plate diameter is .238". 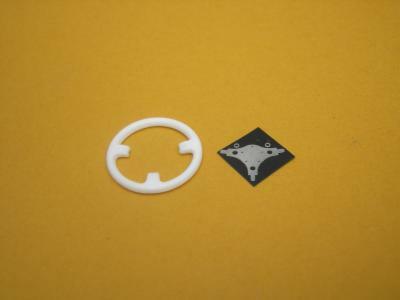 These throttle plates fit the Competition Resin 148 "Shotgun" hat and are .312" in diameter. Finished carburetor (below) is for illustration purposes only. Carbs come unassembled. 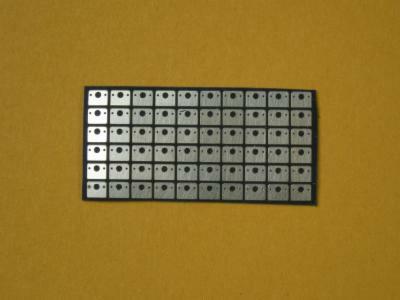 This set of throttle plates fit the Flash Point Resins Square Port injector hat. 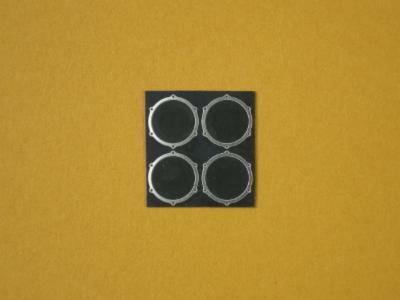 This humungus 3-throttle plate set fits Flash Point Resins Carbon fiber hat and are .372" in diameter. 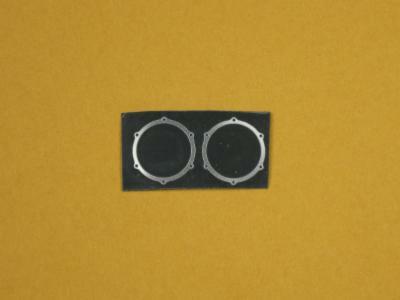 This 3-throttle plate set fits the injector hat on Mark Johnson's 426 Elephant. They are .215" in diameter. 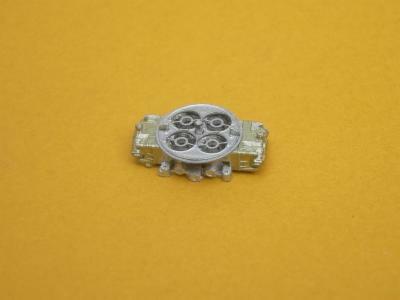 Etched from .016" metal plate, this set accurately replicates the trigger wheels that are popular on lots of race cars. The set also includes the sensor mount and adjustable bracket which bolts to the engine. 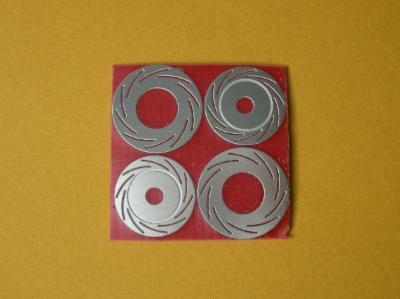 This trigger wheel set is etched out of .016" nickel-silver. It accurately replicates trigger wheels that are used on lots of race and street cars. This set also includes teh sensor mount and adjustable bracket which bolts to the engine. Multi-media steering wheel kit. 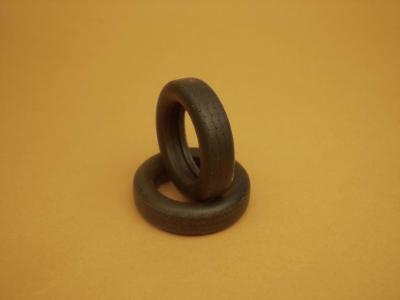 Wheel grip is 3D-printed and will be sold as either printed or resin, depending on availability. Three-spoke wheel center is photo etched and replicates Grant performance #673. These slicks are somewhat smaller in size than the RU-1736-MN2 slicks. These replicate slicks that are labeled as 16x33-16. Dimensionally, they have a 2.072" diameter, 1.106" tread width, and sidewall section width of 1.344". These slicks are intended to fit wheels originally designed to mount FlashPoint-styled wheels. Their ID is ~1.050". True OD is ~2.25" (36" in 1:1). 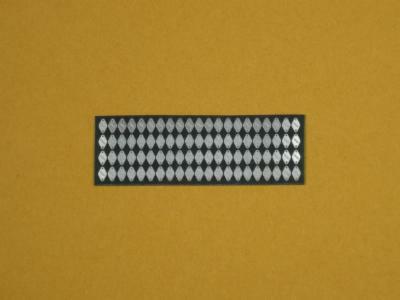 Section width is 1.36" and tread is 1.10". These front tires are designed the fit FlashPoint-styled front wheels from MicroNitro. 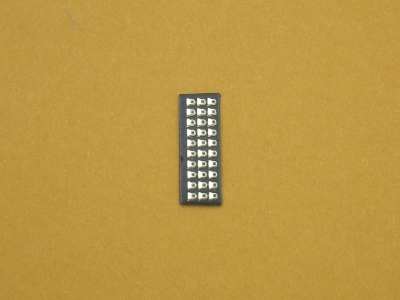 OD, when mounted, is ~1.60"; section width is ~.425"; tread width is ~.280". This set of Lenco levers is etched out of .016" nickel-silver plate and includes the detent levers that fit on the transmission. 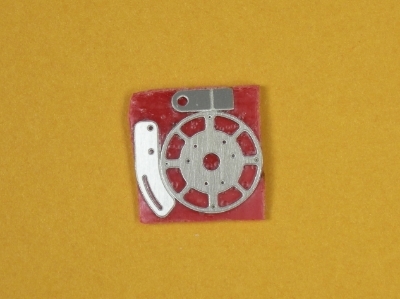 Also included are photo etch grips that can be added for extra detail. This 5-speed clutchless transmission was developed with the use of CAD drawings and was then 3D printed. It is patterned off measurements of a 1:1 Liberty I had a chance to measure. An excellent replica of the real thing. This Liberty transmission and lever kit comes with the items shown below, as well as linkage tubing (not shown).